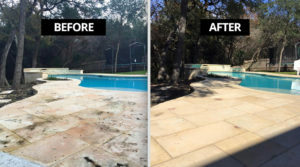 Are you beginning to see that you need a residential or commercial Limestone Sealer Houston product to help you get the most out of your stone? Perhaps you’ve got a pool deck, walkway, or patio that just isn’t properly sealed or cleaned. If you’re trying to make sure you improve this and remedy the problem, we can help. The TSSPRO Sealant is perfect for these types of troubles. Our expert products and professionals can provide you with the quality solutions you’re looking for while saving you money. Limestone is a very popular material for both residential and commercial buildings. Houstonians and Texans alike use this for pool decks, walkways, patios, countertops, and more. It has a wide variety of uses for both outdoor and indoor purposes. Limestone is one of the most popular sedimentary stones on the planet. Made up of aragonite, calcite, and other grains, it contains remnants of the shells of ancient marine organisms and aquatic animals. This makes it an incredibly unique stone for all purposes. Millions of homeowners and businesspeople use this stone for their buildings, but it’s important to remember that it is still very porous. It’s susceptible to dirt, grime, scratches, and other types of damages and debris. Even excessive moisture can cause some deterioration. Because of this, you’re going to need to keep it cleaned on a regular basis and make sure you follow that up with a proper sealing. Failure to do this could lead to a very early repair, replacement, or restoration for your limestone. Cleaning your limestone becomes a lot more difficult when you don’t have a sealant that has been previous applied. Unsealed stones are unfortunately more susceptible to damages during the cleansing process. Harsh chemicals such as bleach, alkaline, and vinegar can do a lot more harm than good when they’re applied to an unsealed stone. Furthermore, using high-power mechanisms and pressure washers can do lasting damage to your limestone. Even an abrasive brush or scrub can cause some lasting damage, and this is simply not what you want. For the best Limestone Sealer Houston products, make sure you count on our team to handle your sealing needs. We have some of the best products in all of America. Our high quality sealants are here to help you figure out the best possible solution for your needs. We’re always ready and willing to help our customers find customized solutions to the stone troubles they might have. Call us today at 888-958-0556 for more information. We have an all-star lineup of proprietary sealants that can help seal all types of different stones and surfaces. Our sister company in Texas has worked in this industry for years helping customers clean, seal, and maintain their stone. We’ve spent nearly a decade helping people with their stones. We understand what it takes to help a customer get the most out of their stone, and we’re here to provide timely solutions. We are a company that continues to stand out from the crowd. The difference between us and some of the big-brand products you might see in retailers is the quality of our product. We use all-natural, alcohol-based solutions that provide customers with high level results that consistently leave them satisfied. You’re probably trying to make sure you’re able to achieve the best possible level of sealing and cleaning for your stone. If this sounds like you, we are the perfect company to handle all of your sealing and restoration needs. Over the years, we’ve had plenty of run-ins with faulty and inefficient sealants. Our professionals know how frustrating it is to have to scrape and pull at low quality acrylic products that don’t get the job done. Once this happened multiple times, we decided that we had enough of depending on the “big brands” to provide us with quality products. Our team got together to start developing the best sealant in America. The TSS Pro-100 is a multipurpose sealant, and it was the first one that our team developed years ago. Ever since then, we have been adding to our inventory and delivering a plethora of different solutions to our product. We added to our collection by developing the TSSPRO-200 High Performance sealant, which is much like its predecessor but with bigger molecules. If you’re trying to get rid of mold and mildew, our TSSPRO-700 will do the trick for you. These are only three of the items in our lineup, but we’re always ready to provide a different sealant solution for you. The TSSPRO Sealant can help you seal your residential and commercial surfaces! After sealing your limestone, make sure you continue to maintain it practicing regular cleaning habits. You’re going to have to do this if you want your tapestry to last the test of time. Setting aside a bit of time for regular sweeping and mopping can do a lot for you. It’s something that you’ll need to implement to ensure you’re getting the most out of your marble or limestone. These are very small and simple actions that might seem very ineffective at first, but their positive effects have no bounds. Don’t fret when you see that you’re in need of a proper Limestone Sealer Houston product and professional company. This is a porous stone that is going to require sealing, cleaning, and maintenance to keep up its lifespan and natural sheen. If you’re ready to start giving yourself the right resources for your stone, the TSSPRO Sealant is exactly what you’re looking for. For more information on our services and products, contact us today. Call our number at 888-958-0556 to consult with one of our professionals on what is right for you. Houston is one of the most diverse cities in all of America. Our city is the fourth populous in the country, and it’s also one of the biggest. We are considered the energy capital of the world, and we have numerous Fortune 500 companies who operate out of our city.